It's been almost two decades since the first electronic edition of The Intelligent Asset Allocator appeared online, so I decided to start with a clean sheet of paper in the wonky world of math-based asset allocation aimed at small investors. Continuing the theme of the Investing for Adults series, this full-length finance title is not for beginners, but rather assumes a fair degree of quantitative ability and finance knowledge. If you think you can time the market or pick stocks and mutual fund managers, or even if you think that you can formulate an optimally efficient mean-variance asset allocation with a black box, then you'd best peruse the reading list first, and come back in a few years. 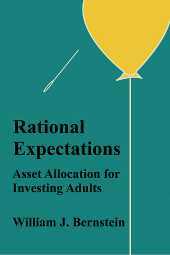 Rational Expectations is now available in Kindle and paperback from Amazon, Nook, and maybe, with luck, in better bookstores everywhere. For years I've thought about an eleemosynary project to help today's young people invest for retirement because, frankly, there's still hope for them, unlike for most of their Boomer parents. All they'll have to do is to put away 15% of their salaries into a low-cost target fund or a simple three-fund index allocation for 30 to 40 years. Which is pretty much the same as saying that if someone exercises and eats a lot less, he'll lose 30 pounds. Simple, but not easy. 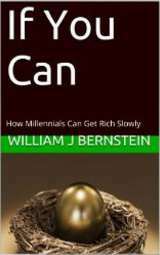 Not easy because unless the millennials learn a small amount about finance, they'll fall victim to the Five Horsemen of Personal Finance Apocalypse: failure to save, ignorance of financial theory, unawareness of financial history, dysfunctional psychology, and the rapacity of the investment industry. Finally, I've been asked by a few readers about a hard copy version suitable for gift giving; it's now available, but I don't recommend buying it unless you want something pretty enough for a wedding or graduation gift (or, if the kiddo is especially precocious, and whose isn't, a bar/bat mitzvah gift). Otherwise, in the immortal words of Abbie Hoffman, keep the money and "steal this book" through one of the above links. Copyright 2018, William J. Bernstein. All rights reserved.